Called “the crown jewel of Elon’s Academic Village,” Lindner Hall’s architecture harmonizes with the Georgian aesthetic of the campus while providing a variety of old-world ambiance and 21st-century academic and administrative spaces. 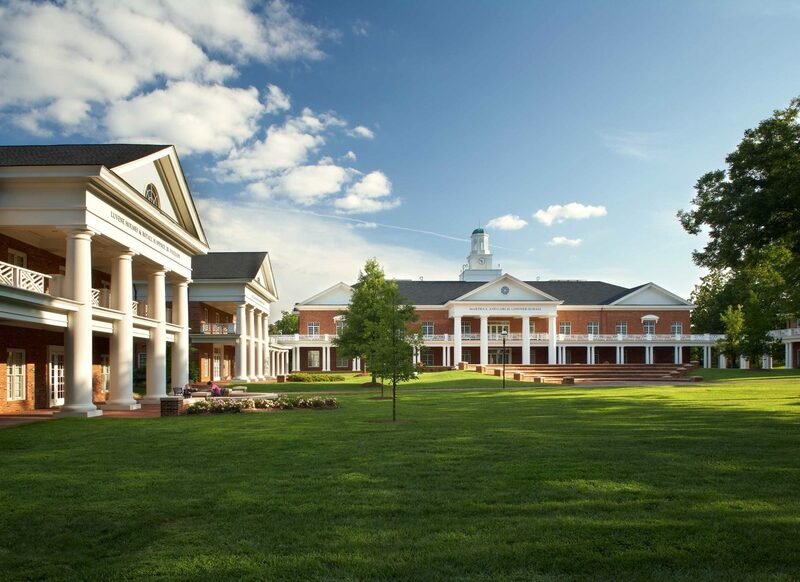 Elon University’s Lindner Hall was designed by SFA to achieve the University’s mission of active student engagement and learning across the disciplines to prepare students to be global citizens. Called “the crown jewel of Elon’s Academic Village,” Lindner Hall’s architecture harmonizes with the Georgian aesthetic of the campus while providing a variety of old-world ambiance and 21st-century academic and administrative spaces. The focal point of the building is the first floor Reading Room, an elegant space furnished with a mix of leather and upholstered reading chairs and accented with dark wood and antique brass fixtures. This offers students a handsome setting for quiet study and reflection. The space speaks to the highest level goals of Elon’s academic program: respect for learning and the advancement of knowledge through personal study. Arranged around the Reading Room are seminar rooms and classrooms, as well as administrative and faculty pods, each consisting of a group of offices surrounding a large student-faculty engagement space. The building’s second floor features additional office/student engagement pods as well as a large conference room. With views overlooking the Academic Village quadrangle and amphitheater, this conference room has become a much requested meeting space on campus. Lindner Hall has achieved LEED Gold certification from the U.S. Green Building Council. Among the many sustainable design features are rooftop photovoltaic panels and a touchscreen display in the lobby that displays the building’s real-time energy and water usage.